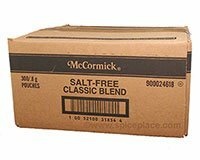 McCormick Classic Blend Salt-Free in a carton of 300 single serving packets. McCormick Classic Blend Salt Free Seasoning is a delicious blend of spices including Red Pepper along with onion, garlic, orange peel, carrot, tomato, corn syrup solids, citric acid, lemon juice powder and lemon oil. This blend of seasonings is excellent with meats, potatoes, omelets, scrambled eggs, vegetables, salads, etc. Use anytime you want to add some delightful (and sodium free) flavor to your meal. Contains 300 individually sealed single use servings. Contains 300 individually sealed single use servings. Not labeled for individual sale. Ingredients: Red Pepper, Onion, Garlic, Orange Peel, Carrot, Tomato, Corn Syrup Solids, Citric Acid, Lemon Juice Powder and Lemon Oil.